Pay attention: the presets available in JetPopup library provide only visual style for GDPR. They don’t offer full compliance with GDPR. Please, install extra GDPR plugin to make the website fully GDPR-compliant. Note: to display content correctly this preset requires JetTricks plugin widgets. Note: to display content correctly this preset requires JetElements plugin widgets. In accordance with GDRP, we would like to btain your consent for marketing efforts. We’ll only ask once. 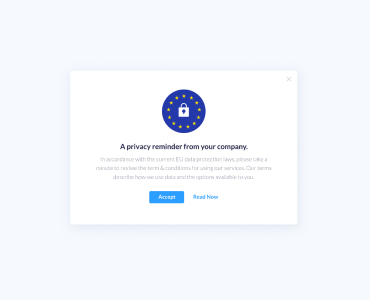 A privacy reminder from your company.